Chennai Event: Learning Session on The Art & Science of Running Restaurants and Launch of the book "Start Up Your Restaurant"
If you're in Chennai on March 16th, this is an event not to be missed. 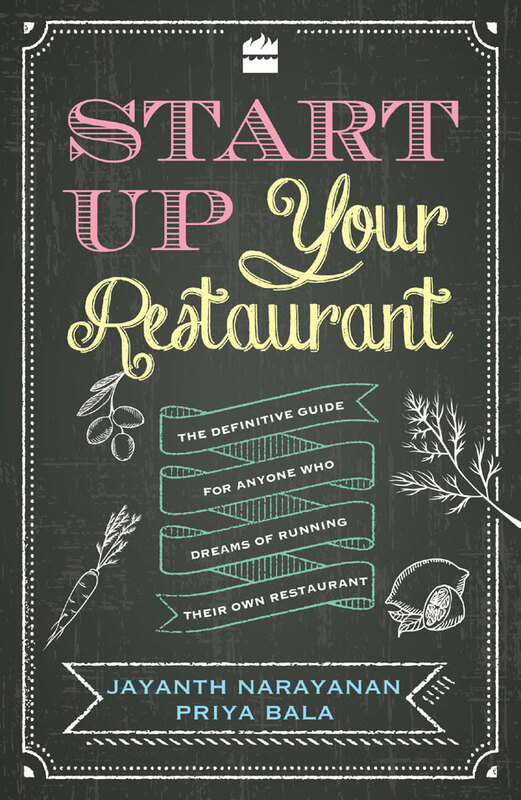 The first review of our book "Start Up your Restaurant" by Sumana Mukherjee on LIVEMINT. So you think you want to open a restaurant? A restaurant cannot be a vanity project but needs to make business sense to survive. It’s such a common refrain that it isn’t even funny anymore. How many times have you heard someone say that s/he really needs to chuck their day job and set up a restaurant? Or maybe you’ve said it yourself. The commonest setting for this observation is usually after a few drinks at the buzziest place in town, while waiters run around with the orders for the table and the music reverberates through the heart. Or, possibly, after a meal at home, when contented friends and family lounge around the dining table and talk turns idly to “wasting your talents” between burps of ghee roast or dhansak. It’s on just such an occasion that someone should produce this book. If it wasn’t called Start Up Your Restaurant, it would be called a Reality Check. The 10-page introduction, in fact, seems to have a single-point agenda: To shake up the reader and make him/her realize that to transform a daydream into a successful business is more elbow grease than greased lightning. So you think you understand the business because you eat out regularly? Or because you are a great cook? Or the entry barriers are low? Or just because you’re sick and tired of sitting behind your laptop all the time and want to be in a place where you can be with friends and have a whale of a time? Get past these pages and then you face the hard questions. Failed (and resurrected) quick-service restaurateur Jayanth Narayanan and food writer Priya Bala have done a remarkable job in breaking down every single process that goes into building a successful restaurant— and, let me tell you, it’s a LOT of processes, right from the conceptualization and raising funds to acquiring licences and advertising the restaurant. The authors are unambiguous and clear-speaking when it comes to the sticky points likely to bewilder a newbie—VC funds or own savings? QSR or cafe? Vast upper floor or tiny ground-floor – or roof top? Splash out on the interiors or on the kitchen? Wine or beer —or neither?—which may be just what the aspiring entrepreneur is looking for. The authors are unequivocal about the fact that a restaurant cannot be a vanity project but needs to make business sense to survive—if only because it has real money sunk into it, be it one’s own or a venture capitalist’s. This takes away some of the romance associated with a dream project but it is perhaps an essential wake-up call. To that end, there are test cases, financial matrix charts, even job descriptions and staff allocation charts. Most inspiring are the first-person accounts from real-life entrepreneurs, both trained restaurant professionals and those who, one day, sat up and said, “I really want to open a restaurant”— and actually did it. 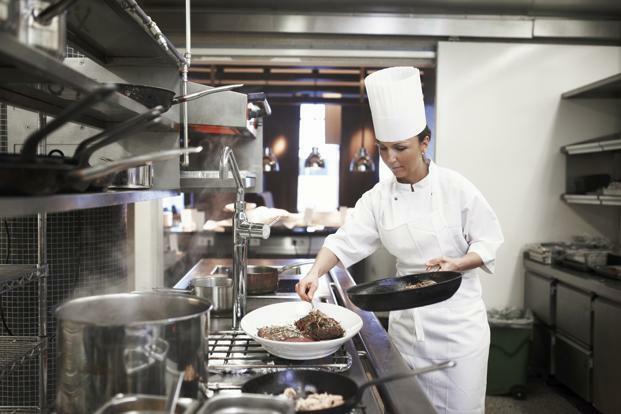 By addressing all levels of the restaurant trade, it is inevitable that the authors will lose some of the nuance required for each segment— more so because many aspects such as trade licences and alcohol permits are state-specific. Still, as far as it is possible for a book to be all things to all people, Start Up Your Restaurant has all the basics covered. It is the book you need to read when the idea strikes you, when you feel like giving up on the dream, when you’re on your way and when you’re there— by which time you could write your own book on the journey. But you won’t, of course, because you won’t have the time. Start Up Your Restaurant -- The Definitive Guide for Anyone Who Dreams of Running Their Own Restaurant, published by Harper Collins, was unveiled by Manu Chandra, Chef & Partner, Toast & Tonic, Monkey Bar, Fatty Bao and Executive Chef, Olive Beach, at the cool space, Numa, on Church Street Bangalore, in the presence of top chefs, Naren Thimmaiah of Gateway Hotel and Ramasamy Selvaraju of Vivanta by Taj on Friday March 4. The launch took the shape of a vibrant, interactive learning session on the art and science of running restaurants. We're going to be conducting these sessions in cities across the country. So watch this space. To order a copy of the book click here. 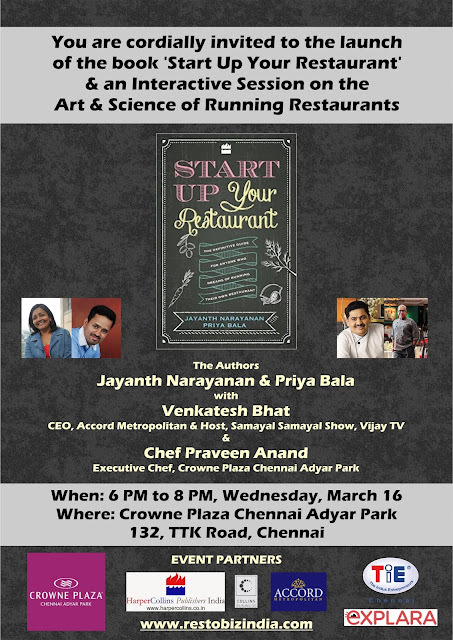 We are pleased to announce the release of our book "Start Up your Restaurant"
Priya Bala, food writer and restaurant critic & Jayanth Narayanan, entrepreneur, contribute to this blog. Restaurants offering a Single Product and why I REALLY like them? Franchising - Is it worth exploring? The Ice Cream Parlor Business - Is it the best investment option in the food business in India today? Cafe Amul - Is this truly a "Diamond in the Rough" in the Franchising space?